The Royal Hospital Kilmainham was established in 1681 to house sick and veteran troops from the British Army. 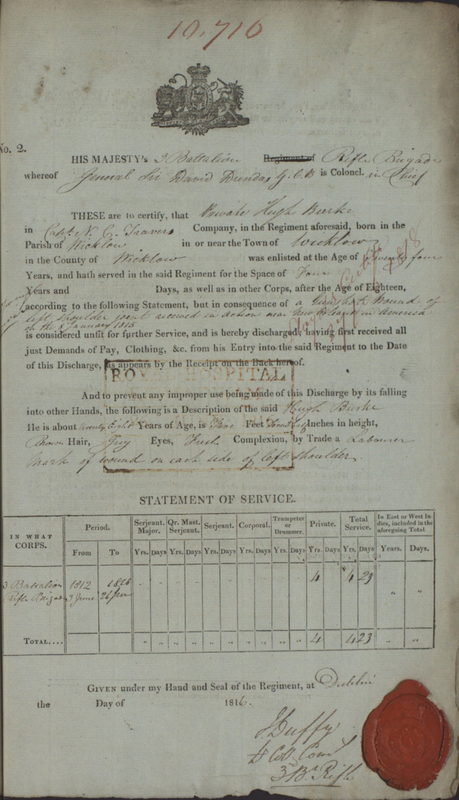 These records contain discharge documents of almost 20,000 men serving on the Irish Establishment in the period 1783-1822. Over 50% of the records are those of Irishmen. Attestation - refers to the date of the creation of the document, in this instance the date of discharge or grant of pension. Fencibles - army regiments raised in the United Kingdom and in the colonies for defence against the threat of invasion during the American War of Independence and French Revolutionary Wars in the late 18th century. Usually temporary units, composed of local volunteers, commanded by Regular Army officers, their role was, as their name suggests, confined to garrison and patrol duties, freeing the regular Army units to perform offensive operations. Militia – originally created as a domestic peacekeeping/police force, could also be used to augment regiments on foreign service. Regiment of Foot – most of the records relate to regiments of foot, infantry regiments which were reduced or increased in size as required. Yeomanry – A British volunteer cavalry force organized in 1761 to serve as a home guard and later incorporated into the Territorial Army.